The circustances regarding the release of Woods 5 are most tragic. Mastermind and frontman David Gold was killed in a traffic accident mere weeks before the album's release, leaving the metal community (especially the Canadian one) in shock. Woods 4 could be considered WoY's breakout album and landed them a deal with Earache. Yet just as Gold's songwriting skill was finally getting the recognition it deserved, fate intervened. Such a cruel twist. 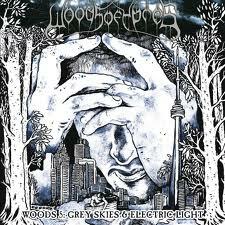 What was to become Woods of Ypres's swansong was, in my opinion, the most emotionally charged album released all year regardless of the posthumous situation. GS&EL's heavily gothic tinged black metal is beautifully crafted for maximum emotional impact; its hooks pulling the listener in close. Gold's lyrics centered around mortality and death are quite gripping and thought provoking yet made all the more real (and at times prophetic) by Gold's early departure from this cruel world. I am not ashamed to admit that Woods 5 brought tears to my eyes almost every single time I listened to it. Woods 5 would most definitely sit at the same position on this list were Gold still with us, but his legacy strengthens the album to legendary proportions. One can only hope David has found the peace in death he never found in life.